One dead, 149 wounded in mosque attack in Libya's Benghazi - SABC News - Breaking news, special reports, world, business, sport coverage of all South African current events. Africa's news leader. One person was killed and 149 wounded, according to Moataz Trabelsi, spokesman for the health ministry of the parallel administration based in the east of the North African country. Twin bomb blasts struck a mosque in Benghazi in eastern Libya on Friday, killing at least one person and wounding 149 in the latest attack to target worshippers in the city. The explosions hit the mosque at the start of weekly prayers in Libya‘s second city, which lies 1,000 kilometres (620 miles) east of Tripoli, a security source told AFP. 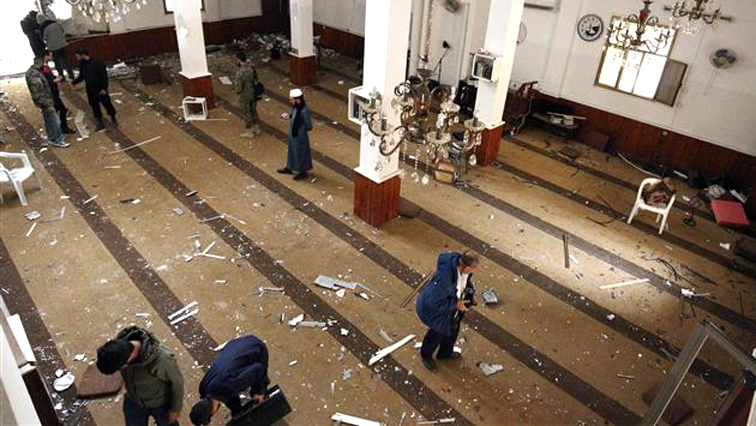 In the wake of the blasts debris was left scattered across the floor of the mosque, with windows blown out and bloodstains smeared on the wall. The security source said one bomb had been hidden in a coffin in the courtyard of the mosque and another in a shoe cabinet at the entrance. A previous hospital bulletin spoke of 62 wounded. The blasts follow twin car bombings outside a mosque in Benghazi after prayers on January 24 that left nearly 40 people dead. There was no claim of responsibility for that attack, which underscored the ongoing chaos in the Benghazi region which is controlled by the forces of military strongman Khalifa Haftar. Haftar, who opposes a UN-backed unity government based in Tripoli, announced Benghazi’s “liberation” from jihadists in July last year after a three-year campaign, but sporadic violence has continued. This entry was posted on 09 Feb 2018,08:18PM at 8:18 PM and is filed under World, Homepage Latest Stories Slider. You can follow any responses to this entry through the RSS 2.0 feed. Both comments and pings are currently closed.